I’ve pained over a headboard for almost 2 years now and currently have these mirrors as my headboard. or this antique mirror, which inspired my decision to use mirrors. However, the size of the mirrors was a guestimate (and I guessed was short as you can tell) and once I brought them home, loved them so much, I was not going to return them. I’ve considered a pinched headboard, with some bling buttons, but I’m worried that I’ll get tired of the bling. I’ve priced headboards and am quite surprised by what some of the stores charge specially when you take into consideration that they’re made of ply-board, then have a foam layer and are then covered with the material. Last weekend, Jarod and I took a walk through the Panorama Flea market and came upon a man making headboards. I stopped and chatted with him. His name is Robert and he gave me a price and we discussed the shape I’d like my headboard to be. His price is almost half of what the stores are charging and he personally fits the headboard as well. I like that it would be supporting an entrepreneur and ‘local is lekka’ and not a huge retailer who has simply imported a million of the headboards from China. So now I’m at the hard part again, deciding on a fabric and shape. I’m considering either a simple rounded top, square or the same shape as the top of my mirrors. I’m also wondering about a ‘boarder’ as in the second photo below. Anyone got suggestions or comments – I’d appreciate some input at this stage. After I finalise the headboard I have lots to still finalise in the bedroom … come along for the ride. Very exciting. I have been lusting after a leather bed for two years now….maybe some day. I am sure you will choose the perfect fit for you…you have such amazing style and taste. I love all your ideas for your headboard and can’t wait to see what you choose. Look forward to following your blog. I LOVE the one with the border ~ the shape is classic and would match nicely with your mirrors which you could then put above your bedside tables. The border gives it extra interest. Where material is concerned I would get something that is durable and easy to clean. I agree that the button ones are pretty but you could easily get tired of the bling. Supporting local entrepreneurs is really the way to go because as you said what is the point of getting one of a million CCI’s. 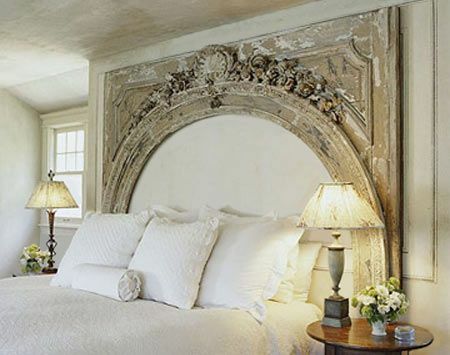 Beautiful dreamlike bedrooms, I adore the mirror arch version!